The earth's biodiversity currently faces an extinction crisis that is unprecedented. Conservationists attempt to intervene in the extinction process either locally by protecting or restoring important species and habitats, or at national and international levels by influencing key policies and promoting debate. Reliable information is the foundation upon which these efforts are based, which places research at the heart of biodiversity conservation. The role of research in such conservation is diverse. 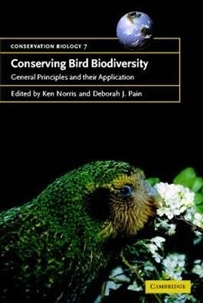 It includes understanding why biodiversity is important, defining 'units' of biodiversity, priority-setting for species and sites, managing endangered and declining populations, understanding large-scale processes, making predictions about the future and interfacing with training, education, public awareness and policy initiatives. Using examples from a wide range of bird conservation work worldwide, researchers consider the principles underlying these issues, and illustrate how these principles have been applied to address actual conservation problems for students, practitioners and researchers in conservation biology.